Apply to improve, correct or change facial features. Brighter tones instantly create the appearance of bags, jowls and crow's feet when used tandem with shadows. Warmer shades diminish undereye discoloration. For corrective use, highlight creates the illusion of a perfectly straight nose. Deep shades diminish under eye discoloration. For aging, strategic application beneath the cheeks, eyes, and jowls creates the illusion of hollow cheeks, crows feet, sagging skin, or bags. 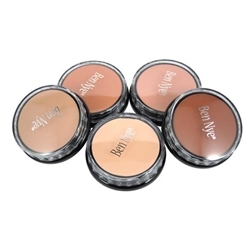 Highlight Wheel (SK-2) Includes Shades: CH-0 Creme Highlights Ultralite, CH-01 Creme Highlights Natural Lite, CH-2 Creme Highlights Lite, CH-5 Creme Highlights Deep.